Replacing fossil fuel by renewable sources have become vital for sustainable or green energy development in India. India’s current energy use is unsustainable. This consists of fossil fuels, hydropower and nuclear resources on the one hand, and combustible biomass and waste on the other, the latter being largely non-traded resources having a share of almost one quarter in the total primary energy supply. Despite a general consensus on need for green vehicles, electric vehicles haven't gone main stream in India as yet. While there are plenty of challenges, ETI Dynamics reveals a hybrid vehicle that adds up solar power for further efficiency. 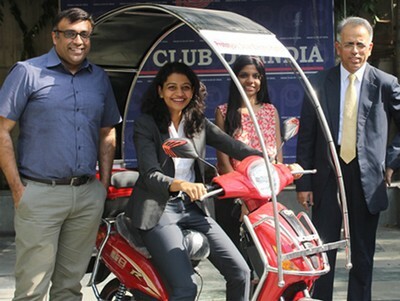 The solar-electric hybrid scooter from ETI Dynamics can travel for more than 50 km on a single charge at a top speed of 45 kmph. India's massive middle class has long grappled with the fluctuating fuel costs. While there are a few fuel-efficient vehicles, dependence on fuel for transportation persists, and doesn't seem to change anytime sooner. From customers' point of view, they don't have much of options either. We have seen a few electric cars such as Reva running on streets. ETI Dynamics, a relatively lesser known name, is working to give customers a solution that can reduce dependence on conventional fuel for transportation. 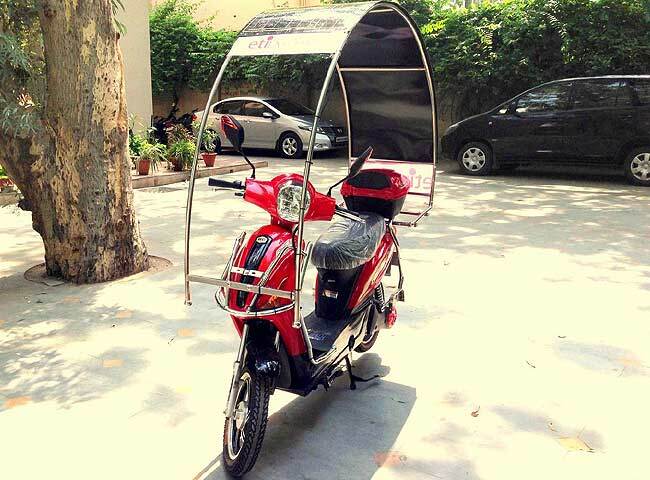 It has just launched a hybrid vehicle that is powered by electricity and solar energy. 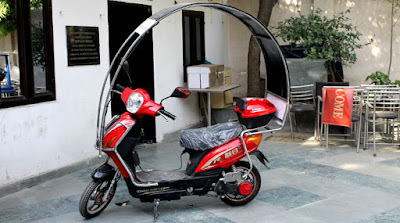 ETI Dyanamics has showcased a prototype of its solar electric hybrid scooter which comes with a canopy of bendable solar panel to provide some shade to the rider and also power the vehicle. “It is light weight, has a weather proof design and propagates the concept of mobile charging infrastructure,” according to the company. ETI Dynamics is looking for other adaptations of this prototype such as auto-rickshaws, buses, golf-carts and shuttles in the near future. “The addition of solar panel to the vehicle increases the distances the scooter is able to travel by 15-20% thus providing more efficiency gains,” said the company in a release. It has partnered with Sunon Energy of India and is also in active dialogues with the Digit Group of USA. “The electric vehicle market hasn’t yet taken off in India due to high costs and lack of charging infrastructure. This is because the technology is restricted to very few platforms like cars. We need the entire eco-system to come up simultaneously which is what we are working on. Just like any electronic marketplace needs a critical mass of buyers and sellers to succeed, the same way electric mobility needs a large number of vehicles with an elaborate charging stations network to succeed. We are committed to bringing new technologies on the road coupled with charging infrastructure coming up at the same time,” said Rajneesh Wadhwa, Chief Operating Officer, ETI Dynamics. “ETI Dynamics is working with a range of vehicle manufacturers and engineering institutions to bring prototypes to road. It is also creating a number of mobile phone applications that will help consumers locate charging stations, make payments, monitor battery performance etc.,” said Sanmit Ahuja, Chief Executive, ETI Dynamics. ETI Dynamics is an investor in technologies, projects and innovations centred on sustainable development.The company will initiate pilots in around six cities in India immediately in the coming months and expects the first batch of vehicles plying commercially on the road in the next 12 months.